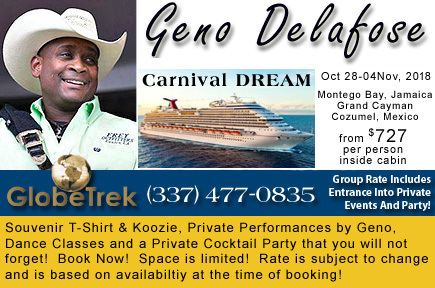 There is no better way to experience the Western Caribbean than on board the Carnival Dream with Geno Delafose! Dance to those Zydeco beats while visiting 3 fun-filled ports! 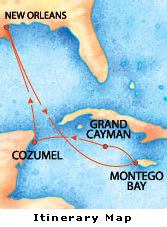 Note: bookings made outside of the group or directly with the cruise line will not have access to the group ameneties (Private cocktail party, T-Shirts, Koozies, Private Performances). *Rate is based on double occupancy. Inside rate is based on a category 4C. Ocean view rate is based on a category 6L. Balcony rate is based on a category 8D. Suite rate is based on a category OS. Rates are subject to change and are based on availability at the time of booking. Additional cabin categories may be available at the time of booking. 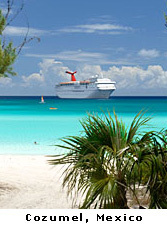 A non-refundable deposit of $25 per person is required to reserve your stateroom. A second deposit of $225 per person is due by May 01, 2018. Final payment is due by August 01, 2018. Triple, Quad, Ocean View and Suite cabins require the full $250 per person deposit at the time of booking due to limited availability.